Opportunity. It’s such a huge word, stuffed with hopes and dreams, all lined up and waiting for that one perfect moment to burst into the open and brighten our world with possibilities. Unfortunately, we never quite know when opportunity will hit, so we’ve got to stay prepared, no matter how long it takes. In my case—seventeen years! 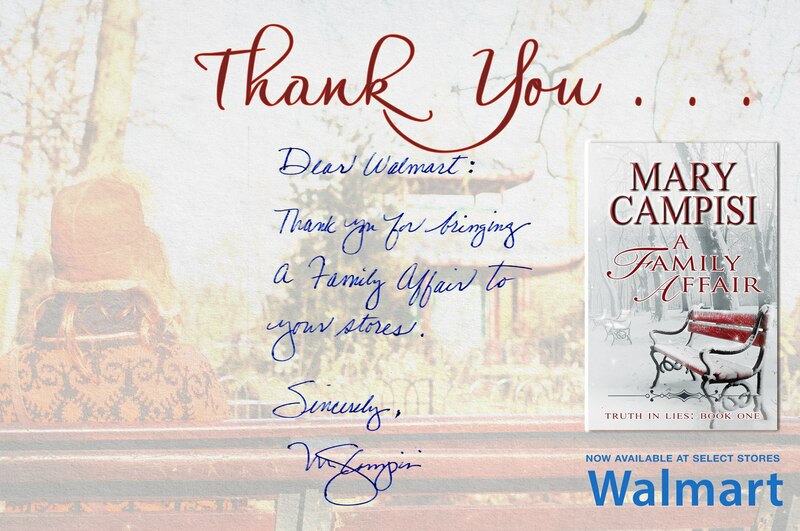 I’d like to announce that Walmart will bring my bestselling family saga, A Family Affair, Book One of the Truth in Lies series, to their stores! I am honored and humbled that this book has been chosen to appear in select stores. (Perhaps it is fitting that a book about hope and second chances was chosen!) Thank you, Walmart, for your faith in A Family Affair. Once again, thank you, Walmart, for this great opportunity! This is a fantastic book series! I look forward to the next book! Thank you! Just a little while longer….busy working on it….twisting and turning and creating chaos in the lives of Magdalena’s residents…But don’t worry, I’ll get them all straightened out, sooner or later. Congratulations, big time, Mary, for making it into Walmart! What a coup. I’ll look for it next time I’m in the Oberlin store. Well deserved kudos. Mary, waiting for the 8th and 9th books within the Truth in Lies series to be released. When are they scheduled to be available??!?!?!? I think this is phenomenal. A huge congrats to you. I’ll be looking for your title in the Walmart stores. Thank you! And for readers who haven’t heard, J.S. Scott is also on Walmart shelves with “No Ordinary Billionaire”…I am honored to share shelf space with you and sending along best wishes for much success. Here’s hoping we get a lot more “sightings” of our books! So very happy for you. Love when other authors do well. Big news! Congrats. I’ll keep my eye out for it. Thank you very much! There’s been a “sighting” in Sonora, California – I posted a pic of it on my Facebook author page…very exciting! This is fantastic, okay cough up how did you do it? I’m so sorry I didn’t respond sooner! I know I saw this post and then my mother came to town and that was it for the next six weeks….I didn’t do anything other than write the book. I was thrilled A Family Affair was chosen. Happy Holidays and again, so sorry for the delay. Congratulations, Mary! You are a great author, so Walmart’s decision makes perfect sense. I’m on the lookout for it here in Oberlin. Just discovered your series of “Family Affair” and can’t tell you how much I enjoyed reading them though I’m only starting the third in the series, your writing lifts me up and brings me to a place my heart needs to be. Sorry I missed your deadline of November 15th but I’m so glad I discovered your books….you are an excellent writer! Thank you for coming into my life…..